Boston University Professor of Economics Laurence Kotlikoff is blunt about the world's fiscal health. Many countries are insolvent, but don't know it, he says. "They are measuring fiscal solvency, namely the official debt, which is really not an economic measure of anything, "says Professor Kotlikoff, who was named by the Economist newspaper as one of the world's 25 most influential economists. He says that official debt includes only the obligations that politicians arbitrarily decide to put on the books. The need to meet the future obligations of a state pension system, for example, is not counted as part of the official debt. "To say it is not a real obligation, or that it is not as important as paying off state bonds is not the case. It is probably less likely to be defaulted on than bonds, because there is more political support for pensions." Similar off-the-books liabilities exist in all countries, says Kotlikoff. And the decision about what to include is a 'language' decision, not an economic one. Economics does not tell us how to measure the deficit, he says, just as physics doesn't tell us what time it is right now. The theory of relativity tells is that time and distance depend on how fast an observer moves and in what direction. Ultimately, they are determined by the frame of reference and the language used. "Economics is the same. The deficit, debt, taxes, transfer payments, disposable income, private wealth, government wealth, personal saving – none of these are well defined economic concepts." Countries around the world have been examining their fiscal affairs using measures that have no connection to them, says Kotlikoff, because nothing in economics pins down the language used. "We need a measure that is independent of our choice of language, and which puts everything on the books – and that measure is 'the fiscal gap'." This gap is defined as the present value of all future outlays minus the present value of all future receipts. If it is positive, it means that the government has expenditures that in present values exceed its receipts. "Major global economies face astronomical fiscal gaps, making them effectively bankrupt, among them the US, Russia, Japan, the UK, South Korea, the Netherlands, and very likely China." Case in point: the US. 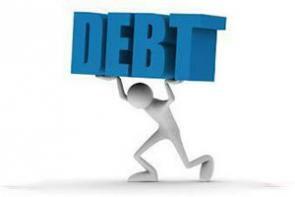 Its official debt is US$20 trillion. But its fiscal gap is a staggering US$200 trillion, or 10% of the country's GDP. Almost everything, says Kotlikoff, has been left off the books. "If we were to keep spending as we are now, in order to pay our bills, we would need to get 10% more GDP in extra taxes every year, forever. That is huge, and it means that the country is broke. I would not be buying long-term US government bonds, if I were you." Eliminating this massive gap would require a tax hike of 53% or a spending cut of 35%, if action was taken immediately, he says. Delay for 20 years and the figures climb to 63% and 40% respectively. Kotlikoff is in no doubt about the underlying cause of this gap – an aging population, coupled with a "post-war Ponzi scheme" financing of old-age pension and healthcare policies. "This finance is called 'pay-as-you-go'. In fact, it is 'take-as-you-go', with each generation expropriating the next. And the expropriation is accelerating." Kotlikoff says the only way forward is for governments to evaluate all spending and tax bills using fiscal gap accounting to see through time whether the gap was being closed. "In the end, a fiscal policy that isn't sustainable means an economy that isn't sustainable." *Professor Laurence Kotlikoff presented a seminar on ‘Our global economic future and how to fix it' in February, 2018, while at the University of Auckland Business School as Sir Douglas Myers Visiting Professor. This article was first published in UABS Insights , and is reproduced with the permission of the University of Auckland Business School.